I'm leaning towards the pressure plate being garbage. They are 3 gph. I thought the same thing after seeing these spray. I can only go down 1 size if I stick with DevilsOwn. I can't modify the mounting depth of the spacer because it needs it for the spacer to seal against SC and IM properly. I wonder if they make nozzles made for protruding further into the bore. I guess I could always just drill and tap the IM and not use the spacer. Any ideas to correct the nozzle depth would be appreciated. I removed the flywheel and you can see the side that the clutch was actually clamping against had some very significant heat buildup. I've inspected the flywheel and pressure plate close. One both there is one side where the clutch clearly mated and wore against as it should. Then on the other side, towards the outer edge it appears to remain untouched by the friction surfaces of the clutch. The original machined face is still like new. I'm thinking the only way for this to be possible is with the pressure plate surface and the flywheel surface out of parallel. 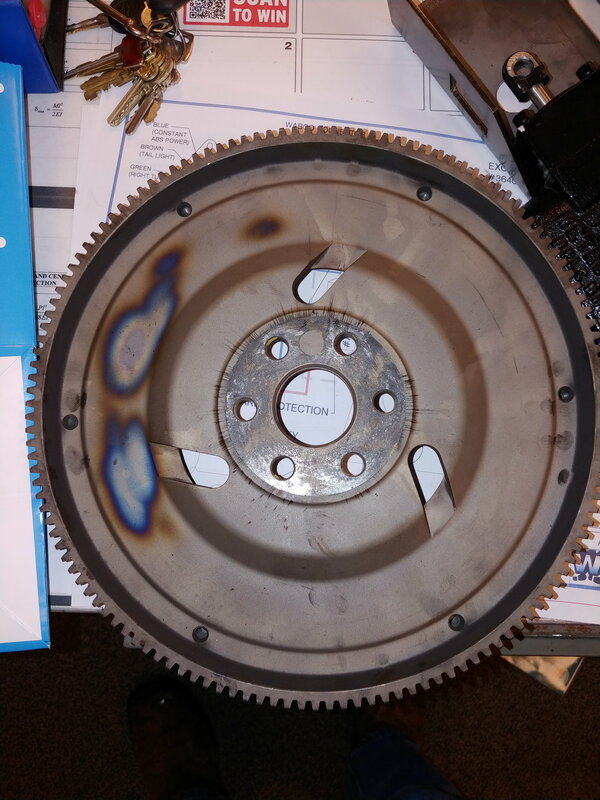 It seems like the flywheel/pressure plate was really only having full pressure applied on one side. This would also make sense why the clutch was dragging at high rpm if one end was a little tighter than it should be. 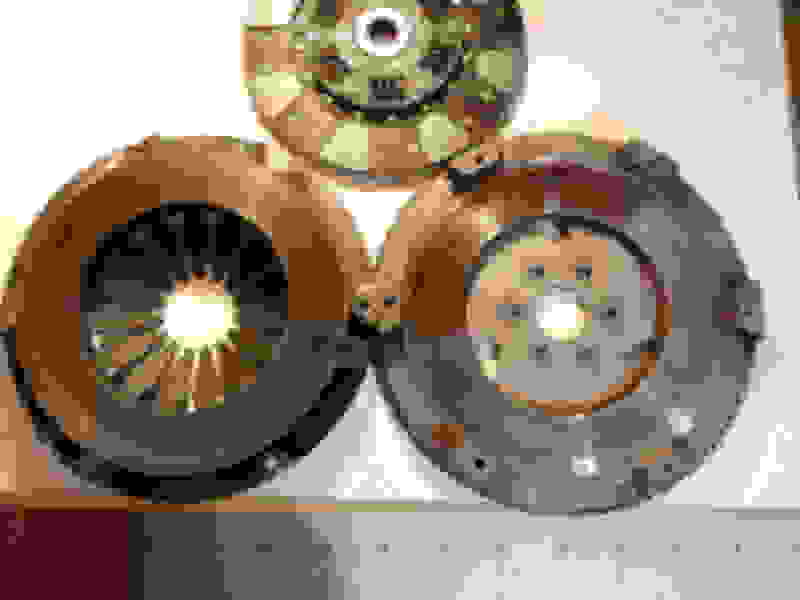 I've been doing some further investigating of my clutch and as far as I can tell this result could not have been caused by misaligned or out of parallel transmission. If the transmission wasn't mated squarely to the block, which would cause the clutch disc to be out of parallel with flywheel/pressure plate, the flywheel and pressure plate would have worn to the outer edge all the way around. I would also guess this would cause the clutch disc to break/fatigue as it would be flexing significantly with every revolution. The pressure plate was also properly fastened to the flywheel. I tightened down the pressure plate bolts evenly and incrementally until I reached final torque spec on all bolts. No bolts were loose when I removed the pressure plate. All felt the same when breaking loose. I'm not ruling out install error because I have supreme confidence in my abilities however, based on what I can tell it wouldn't make any sense to have this sort of wear pattern be caused by install error. The most likely scenario I can come up with is that the pressure plate was not clamping with even pressure around the whole clutch with significantly more pressure on one side. I'm guessing this is due to either material or manufacturing defects in the pressure plate or flywheel even though I have been reassured there is no way the flywheel is out of spec because Exedy products don't make it off the assembly line unless they are deemed flawless. Last edited by jdbaugh1; 01-02-2019 at 08:20 PM. You can't see at as well in the picture but IRl you can see the original machine marks where it appears the clutch never even broke in the surface. You can see it in the crescent moon shape in lower left hand corner of pressure plate and mirrors on lower right hand corner of flywheel. From Exedy:JD, I received your flywheel today. The step height measured 19.2mm (new specification is 19.1 +/- 0.1mm). The flatness at the area with hotspots measured 0.14mm and the area opposite the hot spots measured 0.08mm (new specification is 0.05mm). The flatness at the center of the friction surface rotated 360 degrees around the flywheel was 0.07mm. Since the flywheel was used and has a very bad hotspot 0.09mm over the flatness specification is quite good. There is nothing with the flywheel that would have caused your issue. Due to there being no manufacturing defects there is no warranty. I would recommend resurfacing the flywheel before mounting a new clutch kit. Please provide a return shipping address. Wait... so the flywheel exceeded spec but they say nothing is wrong with it? did I read that right? I think they said it exceeded spec but since it got hot it's on me. There was enough wear on the side that got hot for there to be a visible ridge, from the clutch, so I suppose it is possible that worn area threw off the flatness. But then they also say the flatness on the other side is also out of spec (though not as much) which I don't really see how it could be my fault because that side hardly had any wear. All this happened because I had high rpm clutch drag and tested to see if I had fixed it by revving the car up, with the trans in gear, and depressing the clutch to see if the car would inch forward. Word of advice, that is a good method to test for clutch drag but at 6,5000 - 7k rpm the flywheel overheats in a very brief moment. That's the whole reason one side of the clutch got hot. I can't believe they told me to "resurface before installing new clutch". I emailed them back and asked if they honestly thought I could reuse that fubared flywheel that there is a ridge on one side and heat cracks. the heat likely caused the variation in surface height. 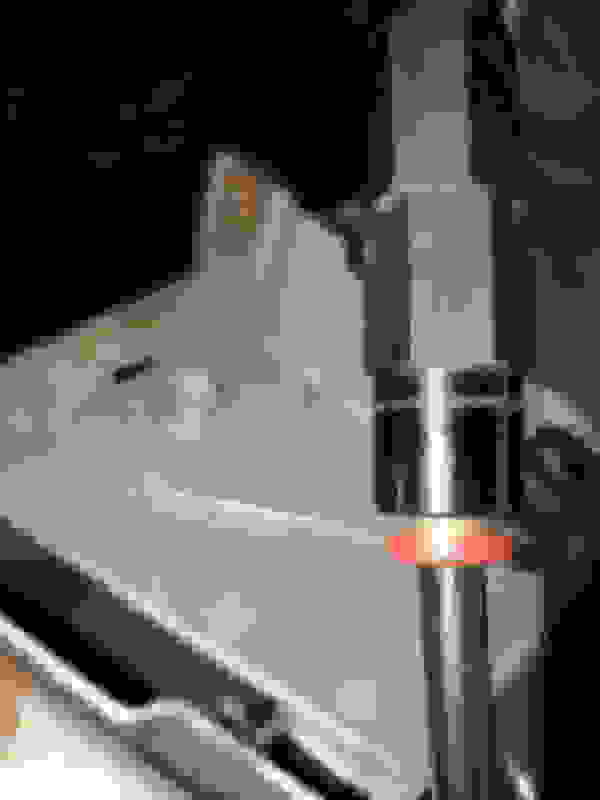 when you heat a spot on a piece of steel enough for it to discolor the metal has to expand and go somewhere. while .14mm sounds like a lot, thats 0.0055", or 5 and a half thousands out of flat at the worst spot. thats 3 thousands of an inch out of spec. keep in mind that when you press the clutch pedal you should have at least .050" between the disc and the flywheel/pressure plate. looking at those numbers, i dont see how any of this could be caused by the flywheel. Thanks for your feedback Sharkey. I have no feel for how precise these assemblies should be. I'm just guessing, based on the clutch dragging on one side of the flywheel and pressure plate at high rpms, that I did not have .050" clearance on that half and I don't know how much tighter than .050" it would have to be to cause the clutch to drag like it did. Well I know it wasn't what you hoped for but at least they took the time to actually go through it verses just saying they did. Very true. At least they agreed to look at it. I really just want to figure out what was off internally to cause the high rpm clutch drag in the first place. A little bit of a refund on this $1k assembly instead of a total loss would be nice too. Was testing spray pattern and noticed check valve is leaking through this crack in the casing. This is the second DevilsOwn check valve I have had fail on me. Will be going with AEM check valve this time around. Ask Snail if he still has his kit floating around. Pretty sure it was AEM. Damn. JD needs like an emergency GoFundMe page for "I keep buying new, I have the worst luck in the world for car parts". I'm not swapping the whole kit over but will definitely be buying an AEM check valve this time. I think both systems used the same size line. You'd think I was buying Ebay **** straight from a shady Chinese manufacturer the luck I have with new parts. Good to know. I'm not currently using their nozzle holders as I am still running the DevilsOwn nozzles and pump. I thought I saw someone post up a check valve they offered but maybe it was Snow performance. I wonder if AEM's nozzle holders would work with my DevilsOwn nozzles. Having the check valve right at the nozzles would be ideal. the aem nozzle holder wont work with the devils own nozzles. iirc the devils own stuff is 1/8npt on both sides of the nozzle, where the aem uses a straight thread and a crush washer where the nozzle screws to the holder. Yeah I looked and I think I will go with Snow Performance check valve and keep my nozzles.